Mr. Kalyan Shelke had organized this camp. Here 55 eye donors signed their consent letters. And these consent letters were handed over to Mr. Kishor Soni. Eye donation registration camp at Sanjaynagar. Distribution of eye donation pamphlets at Aurangabad : We motivated ’round 5000 people by distributing 1500 pamphlets in this meeting. 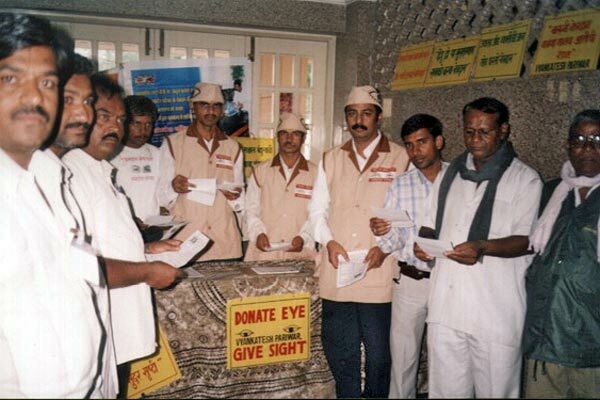 An eye donation awareness programme at Aurangabad was held with Konkan Mitra Mandal. There we motivated 1000 people by distributing 300 pamphlets. Eye donation camp with Konkan Mitra Mandal. 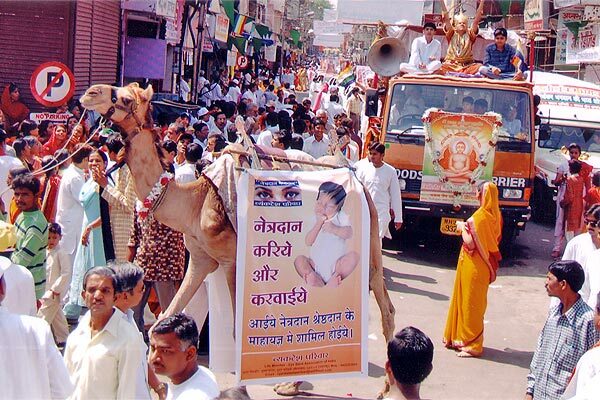 Banners regarding eye donation were attached on the back of a camel during the Mahavir Jayanti procession. We motivated around 20,000 people by distributing 5000 pamphlets. We motivated around 10,000 people by distributing 5000 pamphlets. 30th April, 2006 A get together at Jalan Hall was held by Bhawsar Samaj. There, 15 eye donors filled their consent letters. 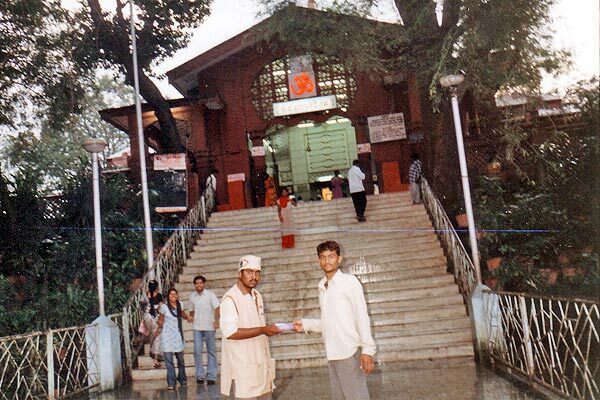 At Tuljabhawani temple’s habitat in Tuljapur, we motivated ’round 10,000 people by distributing 5000 pamphlets. 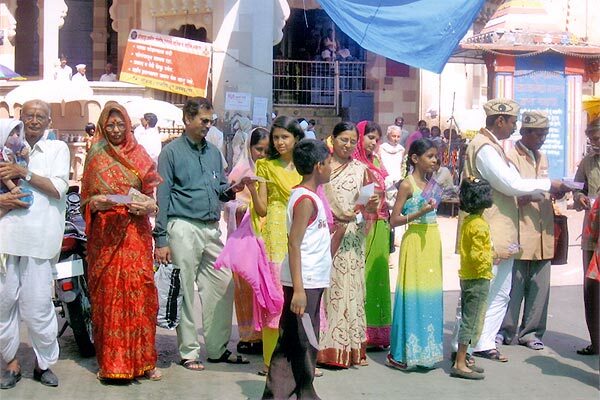 At Vitthal mandir in Pandharpur, we motivated around 15,000 people by distributing 5500 pamphlets. On the eve of Maheshnavami, we joined this procession of the Maheshwari Samaj with our Netradan Rath. It was decorated with the posters related to Eye donation. 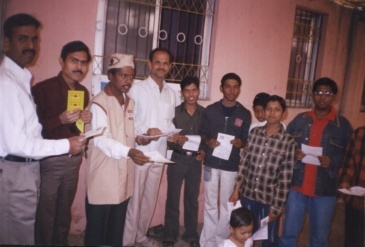 We motivated 8000 people by distributing 2500 pamphlets in the whole town (Aurangabad). A full day eye donation camp at Nutan colony: The opening ceremony was held by Hon. Mr. Kamlakar Phad (The Deputy Commissioner of Corp.), Mr. Khushalchand Baheti (A Police Inspector), Dr. S.R. Baheti (Sr. Physician). Mr. Phad expressed his enthusiasm by appreciating Ad. Kishor Soni that he is doing an innovative & inculcative work. Mr. Phad also told, ” Mr. Kishor, you shouldn’t stop & keep on doing your work of creating awareness regarding eye donation among the people. Here 126 eye donors pledged to donate their eyes. 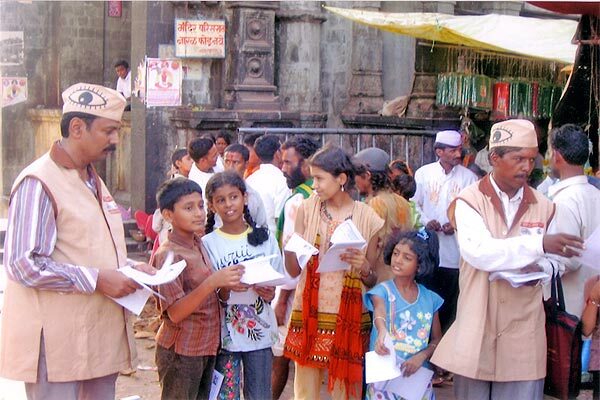 We motivated around 20,000 people by distributing 5000 pamphlets in the whole day. During this session, Ad. 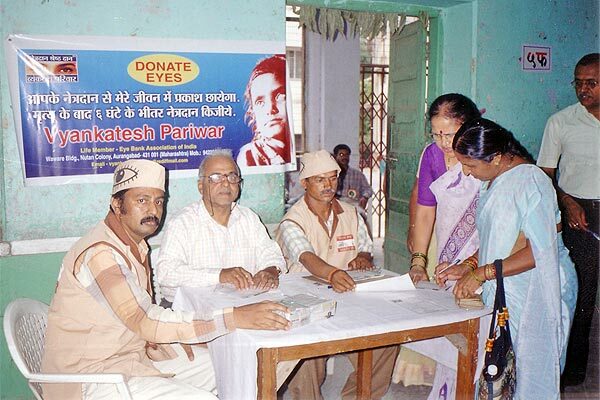 Kishor Soni appealed the people ’bout Eye donation to let it be a family tradition. He also explained the people the importance of it. 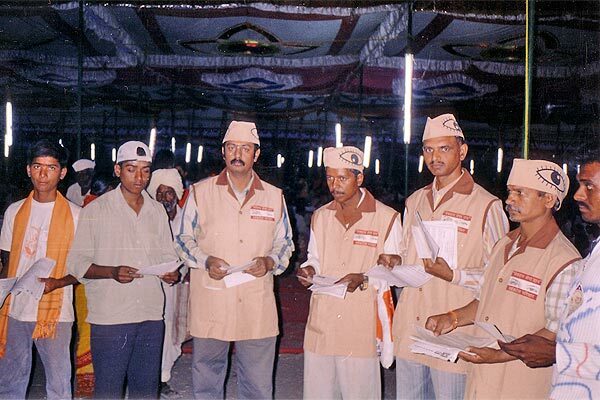 The Adhiveshan of the whole Maharashtra MSEB Tantrik Kamgar Union was held on 6th August’ 06 in Ahmednagar. 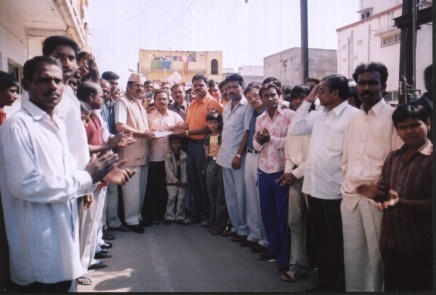 In this programme, we motivated around 15,000 people by distributing 7000 pamphlets. Mr. Balaprasad Tiwari took a lotta efforts for this camp. Mr. Kishor Soni was the chief guest of this programme. 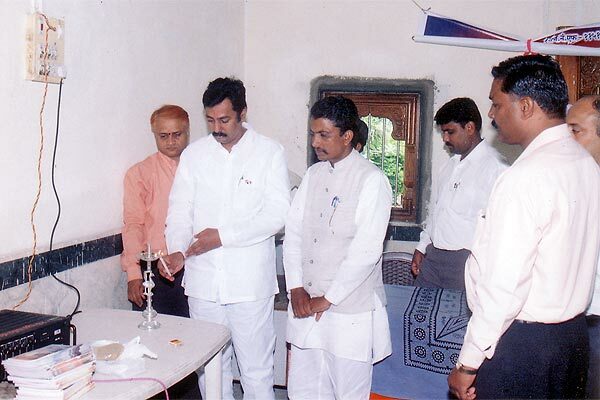 The Bahu-uddeshiya Sanatha is a community who’s work regards the re-habilitation of addict people. 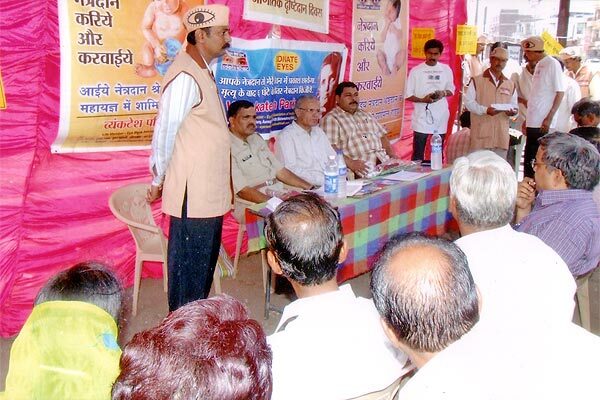 Here too we motivated around 1000 people through a speech on eye donation by Mr. Kishor Soni. He (Mr. Kishor Soni) expressed his views regarding Eye donation in his speech. He also tried to convince the people to participate in Eye donation movement – such a challenging task. In this conference, Ad. Kishor Soni gave information about the celebration of the Eye Donation Fortnight. Every year, the Govt. of India celebrates this fortnight from 25th Aug. – 8th Sep. Vyankatesh Pariwar celebrated it by completing 15 projects at 15 dif. places. It covered Phulambri – A small place to Mumbai – such a big place. We have created a lot of awareness in the campus of Mumbai’s prestigious Lal Baug Raja. (more details with pics in the sub-tittle Fortnight). We tried to motivate 50,000 people by distributing 15,000 pamphlets in both of these places. Among the many Morchas passing by, we tried to motivate 75,000 people by distributing 25,000 pamphlets. We created a huge awareness on this day. On the occasion of Deepawali festival, the Wima organization arranged a 7 days big exhibition. There, 201 eye donation pledge forms were filled up. We tried to motivate 2 lakh people by distributing 50,000 pamphlets. It was a joint project taken by the “Bhartiya Jain Mahila Org.” & Vyankatesh Pariwar at Tera Panth Bhawan. There too, many forms were filled. We tried to motivate 15,000 people by distributing 3000 pamphlets near this toll bridge (Pune-Mumbai Highway) the whole day. 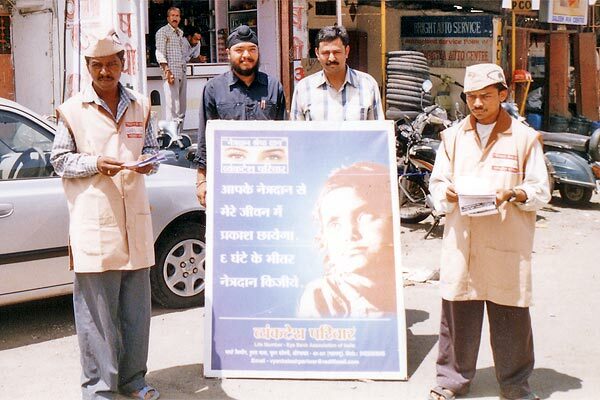 Liflets showing importance about eye donation at Lonawala toll bridge. The Ganpati of Ranjangaon is included in the Ashtvinayaks – The 8 Ganeshas. In the habitat of this temple, we spent the whole day in creating awareness regarding Eye Donation by distributing leaflets. We also tried to motivate 15,000 people by distributing 5000 leaflets. “Eye Donation – A Noble Act & A Noble Mission“.